This is a new web site. Examples are still being added to the "corkscrews for sale" sections. More to come soon! This lavishly illustrated new reference book is a must for all corkscrew collectors, followers of product design development, and anyone interested in the history of metal working in Birmingham and Sheffield. 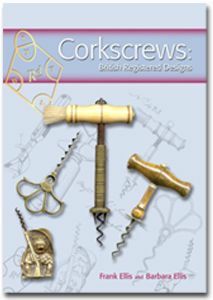 See 384 original registered designs for corkscrews from 1840 to 2006, with full colour pictures of examples and information about their functionality and their designers. Enjoy 84 registered designs for brass figurals, a very British genre, and read about their origins. Discover the family and business histories of 34 key designers, with over 50 historic adverts and pictures. Learn how British design registrations originated and how to date corkscrews from the Registration Diamond Mark or Number. All this in a beautifully bound hard back volume with 380 full colour A4 pages, illustrated with 500 pictures of corkscrews. Please browse through the categories to see the range of corkscrews and accecories for sale. Click on any of the small pictures to enlarge it and get more details. Send us an e-mail if you want to buy your selected item. Don't forget to include your postal address.